Today, the Federal Communications Commission Chairman voted to open a Further Notice of Proposed Rule Making that would include broadband service in the Lifeline program. This is the first step to help qualifying low-income Americans to apply for a subsidy that helps them afford broadband service. The vote was split along party lines with Democratic Commissioners, Mignon Clyburn, Jessica Rosenworcel, and Chairman Tom Wheeler supporting broadband in the Lifeline program, and Republican Commissioners, Ajit Pai and Michael O’Reilly opposing the move. The Rural Broadband Policy Group applauds this vote as a crucial step to ensure all Americans can access essential broadband service that allows them to participate fully in our society. RBPG commends Chairman Wheeler, Commissioner Mignon Clyburn, and Commissioner Jessica Rosenworcel for their leadership in improving this vital program. “Broadband internet is an invaluable tool for everyone, but for people in rural America and Tribal lands, it can truly be a Lifeline to education, employment, information, improving our communities, and sharing our stories. Broadband is a powerful tool to lift people out of poverty and transform communities, yet 22 million Americans living in rural areas and 63 percent living in Tribal lands cannot access the service. One of their biggest barriers is cost. We commend the achievements of the Lifeline program in bringing wired and wireless telephone service to low-income rural and Native Americans, and we applaud today’s vote to include broadband service in the Lifeline program. This historic decision will help Americans facing economic hardship get back on their feet. It will help us build an inclusive society where all can fully participate in our economy, culture, and democracy regardless of where they live or what they can afford. In early March, 21 young advocates from the YouthBuild Rural Caucus participated in a discussion with the Rural Broadband Policy Group about how to improve the Lifeline program. Their conversation consisted of developing a vision of wellness and opportunity for their rural and Tribal communities. Please see the Lifeline Internet principles and recommendations they developed here. 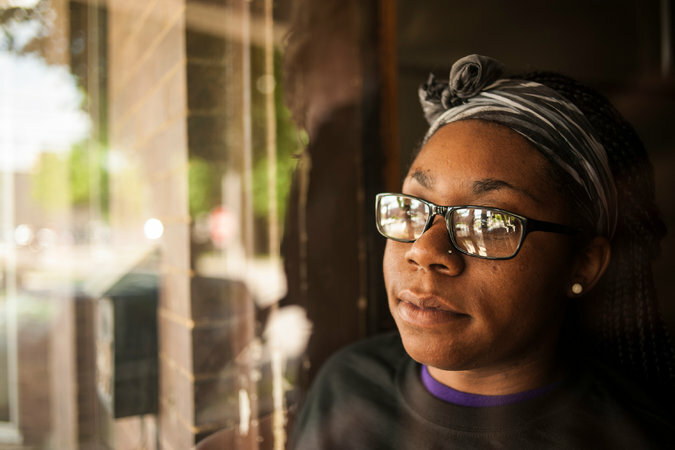 Sharell Harmon, a participant from Elkins, West Virginia, was featured in a New York Times article and recently wrote a poignant OpEd for the Daily Yonder about her experiences as a Lifeline telephone recipient who supports including broadband in the program. The Rural Broadband Policy Group applauds this announcement as another example of the Commission’s continued efforts to ensure all Americans can access the tools that allow them to participate fully in our society. RBPG commends Chairman Wheeler and Commissioner Mignon Clyburn’s leadership in improving this valuable program. “The internet is an invaluable tool for everyone, but for people in rural America, it can be a lifeline to education, employment, information, improving our communities, and sharing our stories. We commend the achievements of the Lifeline program in bringing wired and wireless telephone service to low-income rural Americans, and we strongly support a Lifeline program that also offers internet service. In early March, 21 young advocates from the YouthBuild Rural Caucus participated in a discussion with the Rural Broadband Policy Group about how to improve the Lifeline program. Their conversation centered on developing a vision of wellness and opportunity for their rural communities. Please see the Lifeline Internet principles and recommendations they developed here. Sharell Harmon, a participant from Elkins, West Virginia, was featured in a New York Times article about her experiences as a Lifeline telephone recipient and her support for including broadband in the program. A related press release is available here for immediate distribution. In addition, a New York Times story talking about this plan and its benefits to people like Sharell Harmon is available here. Last week, in Washington, the Rural Broadband Policy Group, Center for Rural Strategies, and Public Knowledge invited policymakers, their staff, and stakeholders to a briefing about the various policy issues implicated in the technology transitions, and how these transitions impact rural communities. We hosted a conversation centered on reaffirming the fundamental values of our communications network – universal service, reliability, consumer protections, public safety, and competition. Below is an introduction to this topic and a variety of related resources, including video of this event. The traditional phone network is a great success story in the history of communications service in the United States. Universal Service rules helped extend telephone lines to rural communities, and today, landline telephone is the most available, affordable, and reliable communications service in rural America. But, the way the telephone works is changing. The telephone network that connects our country has traditionally used copper wires and TDM technology to bring telephone service to your home and business. Now, telephone providers have begun to transition from copper networks to wireless and fiber networks that use Internet Protocol (IP) technology. This change in the underlying technology of our telephone network is a process called the "Technology Transitions." The transitions present us with the opportunity to improve communications services for all Americans, but they must be handled responsibly. It is our duty to ensure a transition in technology is a true step forward for all Americans and that no one is left without a reliable, affordable way to communicate. A change in technologies could change the services available to consumers. A provider might want to stop using its copper lines and offer wireless or Internet-based voice services. But, many rural consumers live in areas with spotty cellphone reception or where Internet service is not available. Retiring copper lines has been a central focus of both state legislation and the Federal Communications Commission’s Tech Transitions efforts. What process should a carrier follow if it wants to retire its copper lines? What services will be in place for rural consumers if their carrier decides to change technologies? Speakers: Mimi Pickering, Appalshop, Kentucky; Jodie Griffin, Public Knowledge, Washington, D.C.